Generate B2B quality leads within seconds. Save many hours and spend those saved hours on closing those generated deals! Not only social media platforms like LinkedIn or Facebook are great for connecting. Checkout what we came up with for Google maps here below. Download the extension and go to Google Maps (.com). 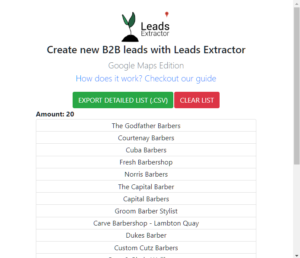 In the Google Maps search bar type (ex: Barbers in Amsterdam) and press the search button (see nr 1 in picture below) or press enter to recieve the first 20 results. Use the pagination icons (see nr 2 in picture below) to recieve more results from Google Maps untill there are none. When you are satisfied with the amount of possible leads in your list (press the extension icon in the top-right corner to reveal the list) press the [EXPORT DETAILED LIST TO (.CSV)] button. The result will be downloadable by pressing the [DOWNLOAD] button that will appear. The .CSV file will be correctly formated with detailed information about the company like; name, adres, phone numbers, website, social media links and more. DISCLAIMER: All data collected by the extractor will not be stored locally on the computer where you install the extractor extension. The extractor will NOT attempt to offload, distribute, broadcast, sell or in any way share collected data. We designed Leads Extractor with the privacy of the user’s data in mind.